Darryl G. Wolfe Publishing Co. The intent of this journal is to document information about Gibson F5 mandolins and related Lloyd Loar instruments. 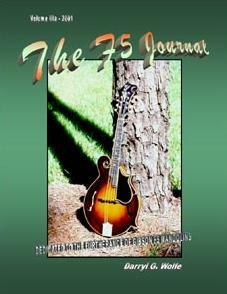 The F5 Journal is the culmination of my experience with F5 mandolins, which dates back to 1966. Many people have written articles and published serial number lists related to Lloyd Loar and Gibson instruments. To my knowledge Benny Cain was the first person to publish a list of F5 serial numbers. His articles appeared in Bluegrass Unlimited during the late sixties and early seventies. During this same period of time, Louis Good and Scott Hambly collaborated on Lloyd Loar research. Scott and Louis gathered much information and kept a list of mandolins, which was passed on to me. Roger Siminoff published by far the most comprehensive list of Gibson serial numbers in his articles for "Pickin" magazine in 1975, 1976 and 1977. The first three "real" mandolins that I held in my hands were Bill Monroe's '23 F5 and Tut Taylor's '23 F5 and A5. These historic instruments were enough to spark my lifelong interest in this field. For many years I kept a logbook on F5 mandolins. Each mandolin had it's own page on which I documented pertinent details and kept track of the instruments' various owners. The list of serial numbers contained herein is a condensed version of an electronic database that I now use to document this information. The information contained in the F5 Journal is the culmination of these years of effort, plus the efforts of all of those mentioned above. The F5 Journal is happy to respond to any and all questions regarding these instruments and solicits any information that will add to the cause. A final thought: I t has been said that an endeavor is a justifiable project only when it can be made to serve a purpose that reaches beyond that of perpetuating itself. At this time, most of these instruments have outlived their original owners, and most will survive their present owners. We, as owners are merely renting a one-on-one slice of time with regard to the life of these instruments. Wouldn't it be great if the instruments themselves could talk? This Publication is the third volume of the original F5 Journal, which was published in February 1987. Several updates have been printed between volumes in an effort to keep the list of known instruments and serial numbers as current as possible. Thanks to all who supported this effort by writing and calling with information concerning instruments. Special thanks to Gibson, Inc. and their past and present employees, George Gruhn, Hank Risan, Joseph Previtera, C. Thomas Isenhour, Larry Wexer, Elderly Instruments and Mandolin Brothers. On the cover: 1923 Lloyd Loar F5 Mandolin No. 73992, signed and dated on July 9, 1923. This mandolin features triple binding on the side of the body, neck and peghead.